Rosa Lee was born on January 10, 1937 in Robeson County. 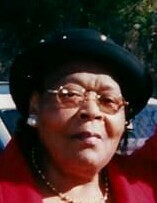 She departed this earthly life on November 18. 2018. She was the daughter of the late Buster and Estalla Thompson. Rosa Lee attended Robeson County Public Schools and was employed at Fairmont Knitting Mills as a seamstress. Rosa was a member pf Ebenezer Missionary Baptist Church where she gave her life to the Lord. She attended Marietta Nutritionist Center for many years. Rosa loved cooking and playing games on her tablet. Rosa Lee leaves to cherish her memories, her husband, Willie Haywood of the home, five children, Mary Ann Worley of the home, Nancy Smith (Jessie) of Fairmont, NC; May Lois Robinson of Fayetteville, NC; Kathryn Cribb of Saint Pauls, NC; and Douglas Haywood of Fairmont, NC; two sisters, Mae Ruth Jones of Fairmont, NC; and Calene Gaddy of Philadelphia, one brother, Ernest Thompson of Fairmont, NC; fifteen grandchildren, her first grand raised by her, Stephain Haywood of Fairmont, NC; and twenty great-grandchildren, and a host of other relatives and friends.